Sayaji Baug Zoo at Vododara is one of the biggest zoo in the country. There are various wild animals and birds at the zoo. One among them is Tortoises. 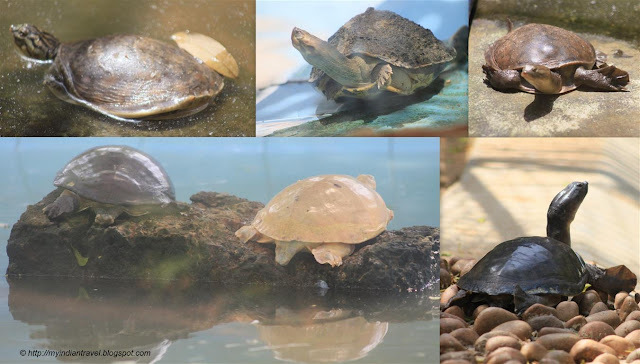 They are land-dwelling reptiles that are shielded from predators by a shell. They vary in size from a few centimetres to two meters. They are the longest living land animal in the world. They move very slowly on dry land. Most of them feed on grasses, weeds, flowers, and some fruits. There are also some species that feed on worms or insects. The zoo has variety of tortoise species. They are fascinating creatures aren't they? I remember my sister and I had one when we were children.He kept on wandering off and one day we just couldn't find him, we were very sad. Glad to have your company on Mosaic Monday today. Funny looking creatures! Happy MM! Tortoises are good animals for children to watch since they move so slowly. Great photos. strange looking turtle. Great shots. A wonderful place to visit I imagine.. I love zoo's, as you might know by now... if I ever will visit the one you mention here? Great photos from the zoo. poor tortoise. prisoner in the zoo. Great creatures - they look almost prehistoric. They look quite content. Best way to be.